Right now we are waiting for new Gordon MITCHELL Surrealism Art to arrive at the gallery. In the meantime, here is a wider selection of the artist's work featured at the Red Rag Modern Gallery. Gordon Mitchell was born in 1952. He studied art at Edinburgh College of Art from 1970 - 1974 and subsequently pursued a career in teaching art. In 1989 Gordon Mitchell decided to become a full time professional artist and left teaching. Gordon Mitchell is a prolific painter. Although often describe as a surrealist artist, Gordon describes himself as an 'abstract expressionist'. Inspiration for his paintings can be a group of words, a topical news story, but more usually it's a visual pun that his pictures develop out of. His modern art works are certainly thought-provoking and visually striking. Gordon Mitchell has been described as one of the finest Scottish draughtsman and imaginative painters of his generation. His paintings display a balance and tonal harmony of a fine Scottish colourist. Mitchell's paintings are beautifully executed and can be amusing at times, at others ironic. Some say it is dark, but this is not always the case. 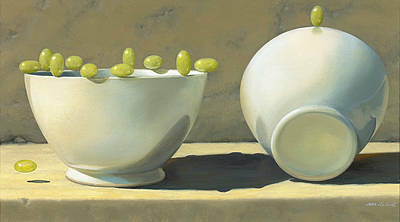 The paintings range over many subjects from fruit and ceramic vessels to the human form represented as all manner of objects. Gordon is certainly the master of unexpected juxtaposition and constantly delights his many art collectors and admirers with his technical brilliance and offbeat sense of humour. Mitchell uses humour, pathos and irony in his paintings to interpret his thoughts and make them palatable to a world that might sometimes rather not be reminded of the problems it faces, collectively or individually. Gordon Mitchell is a driven individual and prolific painter. He likes an intensive, regular, daily eight hours in his studio. Sculpture, for which he also won prizes at College, continues its appeal; but for Mitchell, it involves a process that takes too long whereas to him, painting is an immediate form of expression - often he will not know what he will put on his canvas until he takes up his brush. Gordon Mitchell is an elected Member of the Royal Society of Painters in Watercolour (1997), the Royal Glasgow Institute (1998) and the Royal Scottish Academy (2005).His modernart work has won numerous awards and his paintings are represented in a number of important public and private art collections including Kansas City Art Institute, Paisley Art Institute, Ralli Museums, Royal Bank of Scotland, Scottish Arts Council, and the University of Edinburgh. In addition to Red Rag Art Gallery Gordon Mitchell art work has been exhibited at other leading Scottish Art Galleries. Each painting at Red Rag is sourced from the Gordon Mitchell artist studio and like all Red Rag Modern art and Contemporary art it can be shipped worldwide. Gordon Mitchell Limited Edition Prints are also available from Red Rag Gallery. This is where you can see all of the Modern surreal artists and paintings.